Please note this is a mixed resolution product. Tracks 1-94 and 107-116 are presented in FLAC 192kHz/24bit, tracks 95-106 are presented in FLAC 44kHz/24bit. The Eagles created an indelible musical legacy over an extraordinary career that spans more than 40 years and includes six number one albums, more than a dozen Top 40 hits, and six GRAMMY Awards. This fall, LEGACY will bring together all the music that made the Eagles one of the best-selling bands in music history in one extraordinary collection. Grammy-winning mastering engineer Bob Ludwig remastered the Millennium Concert especially for LEGACY, which – along with several tracks from the Singles and B-Sidescompilation – are being released for the first time ever as part of this collection. 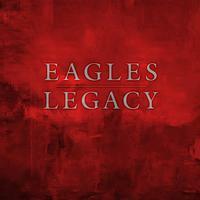 LEGACY follows the Eagles through the different stage of the band’s storied career, from the country-rock of early albums like Desperado and the superstar success of Hotel California, and its most-recent studio album, 2005’s Long Road Out of Eden. All of the band’s hits, deep cuts and fan favorites are here, including “Take It Easy,” “Already Gone,” “Hotel California,” “Please Come Home For Christmas,” “Heartbreak Tonight,” and “No More Cloudy Days".